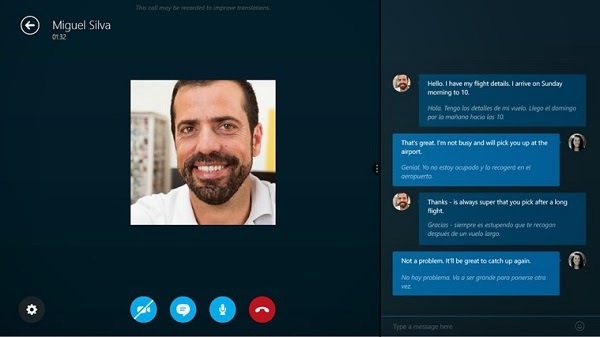 Skype Translator automatically translates your voice and video calls with real-time translation . Register now for a chance to preview Skype Translator. Skype Translator helps you communicate across language barriers, bringing people closer together. Simply set up a Skype Translator video or voice call with someone on almost any Skype client who speaks another language and start talking. Translator is currently available in English, Spanish, Italian and Mandarin. More languages are coming soon. ✔ You can call almost anyone who has Skype. ✔ Your conversation is translated into another language in near real-time. ✔ What someone else says is translated back in your language. ✔ An on-screen transcript of your call is displayed. ✔ And you can send instant messages across 50 languages - from Arabic to Yucatec Maya.